Some books have got a great idea behind it and a promising start, but still fall short. For me, Coin Heist was one of such cases. This may be a light read that one can go through very quickly, especially if one does not think much while reading it, but it also isn't that memorable. It used a number of clichés in a predictable way and, even though it's a book where the characters are said to be in constant danger of being sent off to prison, I never worried about them. Because that's the thing, we are told this is something huge. But is the danger shown? Not really. It seemed like they had it too easy. As for the writing, I've got a bit of a love/hate relationship with it. The story is told in the first person from the view points of the four main characters, all of which are easy enough to distinguish, which is obviously good. Until, of course, one notices Alice's chapters stands out too much in terms of language - she is the only one who will insert jargon in her speech. So this made me wonder: if Alice can describe relationships using mathematics, then why can't the group's athlete speak of events with sports terms? Or the musician pay close attention to the sounds they encounter? Why is only one character constantly equating her life to her passions if the others are supposed to adore their hobbies? I don't know if there is a reason for this or if the author let it slip, but it was bothering. The rest of the writing was fairly alright, even if it did lack suspense greatly. Another issue I took lay with the fact that although all characters have problematic lives, none of their personal issues was resolved. I dare say they were not even properly tackled, only mentioned. One would expect that this YA novel would at least speak more of one character's bulimia, which is only mentioned of a couple of times in passing. Seeing as plenty teenagers, the book's intended audience, suffer from eating disorders, one would hope it would be given the right treatment. Instead, it was as important as one's favourite colour. There was too much focus on the planning of the heist (which is the majority of the book) and too little of everything else. 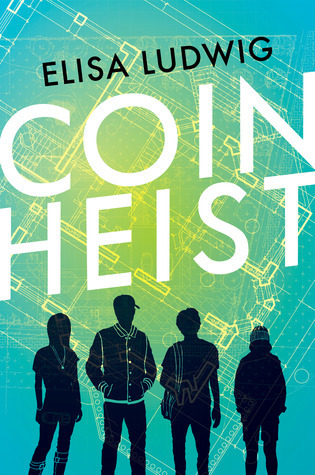 Sadly, all of this makes the Coin Heist feel flatter and flatter by the page, even if it is a very easy read. It's not challenging in the slightest. It's predictable both in character, action, and consequences, so you don't need to think much of what is happening or wonder what will happen. In short, if you want to fill a couple of hours with mind-numbing entertainment, this book could do the trick. If you're looking for something more fulfilling, I'd recommend looking elsewhere. "We were knee deep in a river of crap, and I was wearing metaphorical flip-flops."